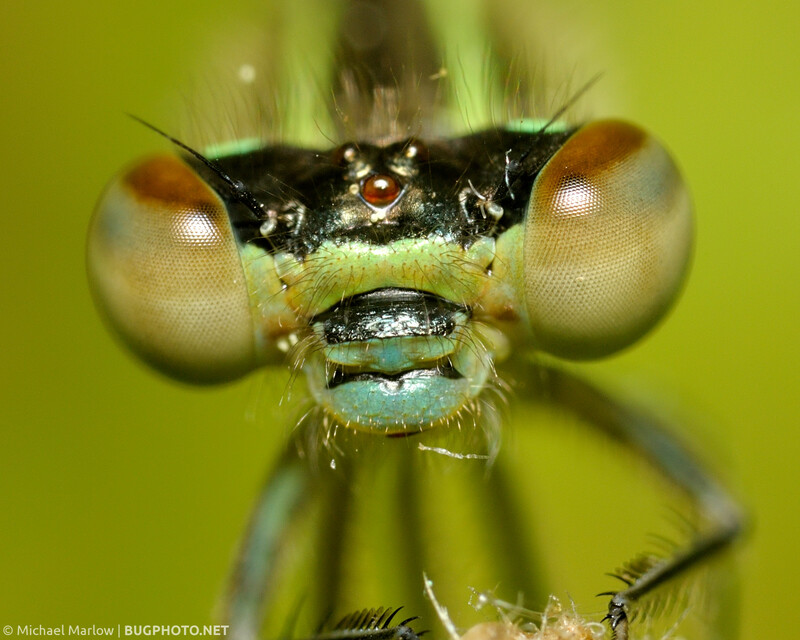 The damselfly isn’t all eyes…but it’s close! My laments about higher-magnification OCD aside, it really is fun to get close. In a bug portrait where the insect is naught but a “face,” one can’t help but imagine it looking at the viewer. From there it is very easy to anthropomorphize, one of the chief thrills in bug photography. What emotions can their forms and motions imitate – and without trying! (Or if you want to be a stickler, what emotions are imaginations can interpolate…) Photographs are in a sense always a mirror, but in these cases the mirror becomes very clear: what we see can show us something about ourselves. A few notes on this one: my suspicion is that this damselfly is a teneral, i.e. newly-emerged adult that has not attained final coloration… The flat face works very nicely here with the shallow depth of field; a little more protruding on the snout and a short focus-stack may have been more ideal…The specular highlights are reflected with pretty hard light, but I think the eyes work well. I am less pleased with the reflections up the center of the face; they are a little distracting. Some more diffusion was probably in order for this shot – though light falloff would be in order and then it’s time to deal with those macro tradeoffs again. Posted in DamselfliesTagged anthropomorphizing, bug portrait, compound eyes, damselfly, mirrors, specular highlights, stranger in the mirror, ZygopteraBookmark the permalink. You will forgive my use of the same title in the coming days, I have had to automate my posts while I am away from my computer. Lovely portrait, great to get that close! I did get pretty close to this one. If memory serves, I was down on all fours; the green background is the grass, not necessarily the best place to get super close up, but not the worst either — that is if you can get down and contort the body into an accommodating position. This one was definitely one of those that left me sweating afterwards.